This is the second Christmas that Emily has been in a cast because surgery and rehabilitation can be scheduled during the long university summer break. It isn’t the best season to be wrapped up to the elbow as the heat does induce additional finger spasms with some neuropathic pain but these discomforts are short-lived. This second surgery has been less arduous and draining because we had realistic expectation following our experience of deltoid to tricep tendon transfer in 2013/14. The cast has been easily accommodated in the shower with the help of a bin liner and sellotape. It didn’t dent our Christmas cheer or quash our New Year’s celebrations.It hasn’t impacted on our activities because we scaled down our diaries or is our nonchalance towards this purple fist cast because we accept Emily’s post operative immobility as we anticipate her future functional gain? This surgery has been easier because there was less fear, this second procedure was relatively straightforward and many surgical and rehabilitation aspects are repeat experiences. With a known entity comes placidity and patience. Recovery is welcomed with restraint and tranquility, nothing can be rushed or hurried, best to accept the inconvenience as a speed hump and slow down. When a repeat experience leads to a positive functional outcome we are more likely to be consensual, compliant and co-operative as we acknowledge an anticipated goal. When surgery is an accepted part of the journey to increased ability there is minimal criticism because we value the consequences so highly. Basically I am less able to critic this event because it is already becoming our Christmas norm, a reality that isn’t feared, it isn’t as impactual as we’ve adapted, calmly anticipating its value to Emily’s dexterity and capability. If I don’t mention details now I will forget as I recall less and less minutia as I accept our circumstances, year on year. 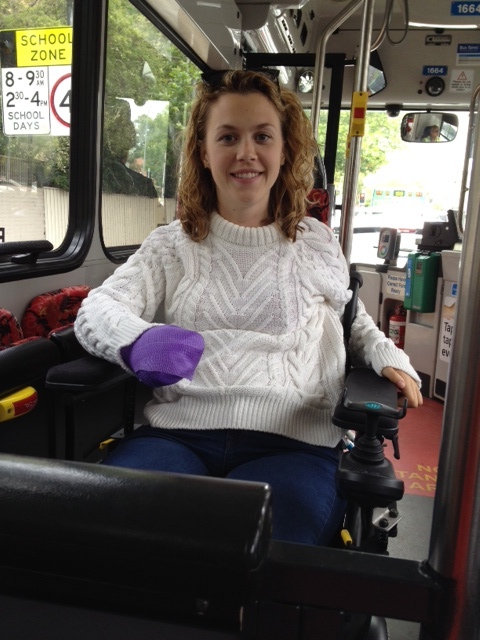 Emily has coped admirably and held her cast aloft like a leader rallying her troops forward, encouraging us to follow her into Woolworth’s, onto the bus or up Spofforth Street to grab a sandwich and a latte! We visit the hand clinic tomorrow. These visits are unceremonious, amenable and relaxed yet the surgeon’s skill is so evident, Emily gains through this specialist dedication and proficiency. There is one facet of medicine that will always prevail, our thanks to the nurses, doctors, surgeons and physiotherapists, we are very grateful and I would never forget to mention that. This entry was posted in Medical Issues and tagged Brachioradialis tendon, Brachioradialis to Extensor Carpi Radialis Brevis Surgery, Change, Everyday Caring, Flexor Pollicis Longus into the Radius surgery, hand surgery, Rehabilitation, spinal cord injuries, Surgery, Surgery for improved hand function in quadriplegia, Tendon Transfer Surgery, Tenodesis by everydaycarer. Bookmark the permalink.